Because - sorry - there really was no detail before. I promised a reader that I'd do a cost breakdown of the ottoman I made, as well as a how-to post, so here it is. Here's the first ottoman post, in case you missed it. First, a cost breakdown. It's not as cheap as you might expect a piece of home-made furniture to be. The fact is, we spent about as much on materials for this ottoman as we might have spent on a very inexpensive but not-quite-perfect version. I had very specific parameters in my head for the size, proportions, color, and style of the piece, and I just wasn't willing to pay a couple of hundred dollars for a compromise. Like I've said before, I hope never to buy another piece of place-filler furniture. But foam, fabric, and wood are expensive. And on that note, here's what the ottoman cost us. I already had the few upholstery tools I needed, like a staple gun and a tack hammer, and we also had wood stain and tung oil for the legs, so if you're brand-new to reupholstery or working with wood, you could spend a little bit more. It's crazy how it all adds up, isn't it? But that's less than half the price of a similar one from Ballard Designs or Restoration Hardware (where there are also surcharges on shipping and certain fabrics), and one-third or one-quarter the price that I saw in a lot of designer showrooms. Of course, you could just spend a little more on one from Target, and they do have some really fun ones. They even have a few that boast hardwood frames. I'll stick to what I said in the earlier post; the bumper that wraps around the sides of the ottoman (in trying to copy this one) made the process incredibly convoluted, and I'm not going to go into too much detail on it here. But to build a regular tufted ottoman like this one, where the tufts simply go to the edge, and there are creases going down the sides, wouldn't be all that hard to do. I haven't built an ottoman exactly like that, but it shows up in both of my books on upholstery (this and this), and I feel safe outlining a few how-to steps. 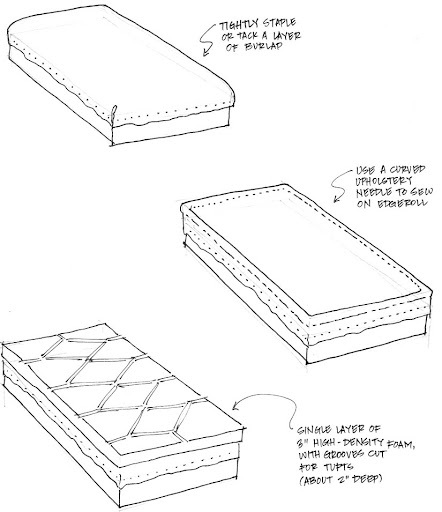 Here are some super-rudimentary, illustrated steps. 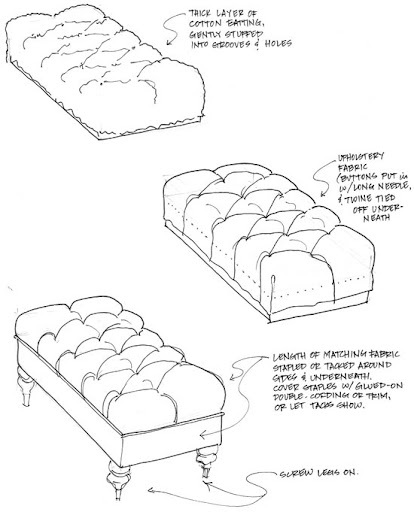 When applicable, I'll link to an old upholstering post that covers the basic concepts. However, if you're going to endeavor a project like this, I'd definitely recommend doing a little research and buying a book or two. Sorry in advance about the quality of the pictures - I didn't have much time to spend on them, but I think it's at least clear what the steps are. Details on installing the jute webbing are available here. High-density foam is available here. Carve the foam with a long utility knife, like in this picture. Here is a post that covers button-tufting in detail, and here's one that discusses purchasing fabric. You'll need three to four yards of fabric to cover a 24" by 40" ottoman, plus another yard for double-cording and buttons. Cotton batting is available here. Turned legs are available here. I know it's not super detailed, but I hope that helps a little for anyone who wants to try this! It's shockingly straight-forward. I do hope you'll try it yourself! This is incredible. Really. I can't wait until you come up here and build me one in mid-May! For me, and I've told you, the part about buying things online seems just as scary as making this myself. Why can't I shop online!? Thanks so much for all these details! Looks like your sketches are as pretty as your diagrams! You guys did a great job, your ottoman looks very professionally made! Thanks so much for this post! This is the first DIY tufted ottoman that actually doesn't look DIYed. 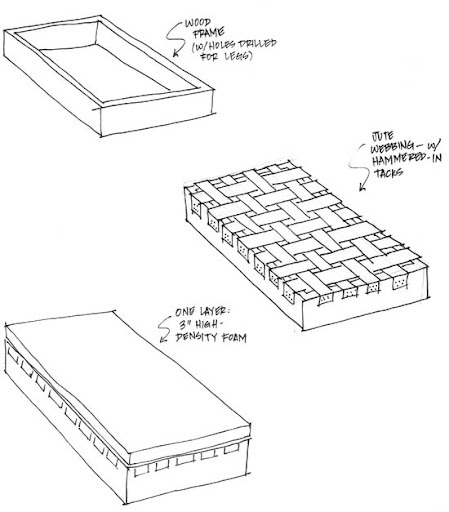 I want to tackle this project myself pretty soon and your diagrams are very helpful. I have the Reupholstering At Home book already so I was glad to see that it was one of your resources. Great work!